The luck of the Irish is always on your side in Emerald Isle, a fun, 5 reel, 20 pay-line, multi-coin, video bonus slot game. The winning starts when a pair of four leaf clover or pot of gold symbols stop on a covered pay-line for a win of 3 times your wager. Get a pair of Irish Lasse symbols and your win tops in at 4 times your wager. Two Rainbow scatter symbols anywhere will pay you double. 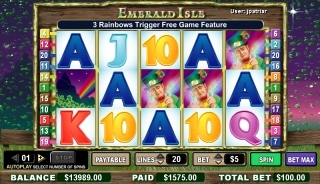 A Leprechaun symbols substitutes for all symbols except the Rainbow scatter and just a single Leprechaun stopping on a covered pay-line will double your bet, get all 5 Leprechaun and your awarded the top prize of 6000 times your wager. The frequent wins just keep getting bigger as a set of number and letter symbols round out pays of 5, 10 or 15 times your wager when a matching combination of 3 stop on a covered pay-line. Throw in the Leprechaun symbols to complete the match or further increase your win. Get the Leprechauns on reels 1 and 5 and the bonus round is triggered. In the bonus round you pick 3 squares one at a time from a grid of 9. Behind each square are the top paying reel symbols. Match 3 symbols correctly and you win the prize, plus you get to pick again for a maximum of 3 rounds. The biggest win pays 100 times your triggering bet. Even if you don't match any you're still awarded a consolation prize. That is only the first bonus round you can win in Emerald Isle. A 10 spin bonus feature is triggered when 3 or more rainbow symbols appear left to right and each free spin win is tripled. Get the rainbow symbols again during a free spin and and free spin bonus round is retriggered. Get the Leprechauns on reels 1 and 5 and you really get to take home the gold.